Background: Tennis elbow is a syndrome of insidious onset with tenderness, pain in movement and decline in grip strength. Pulsed Electromagnetic Therapy (PEMF) and ultrasonic therapies (U.S. therapies) are proving adjuncts for enhancing fracture healing, reducing inflammation and symptom relief to varied extent in different reports. The benefit of two therapy regimens in tennis elbow is comparatively evaluated in patient of our region. Methods: 60 patients sequentially enrolled following informed consent were administered either PEMF or ultrasound therapy daily for 6 weeks. Parameters examined were pain score, pressure pain threshold (PPT) and pain free grip strength (PFGS).
. Results: It was found that either of the therapies PEMF and U.S.therapy significantly improved the three tested parameters. The relative improvement in pain score between two treatment groups did not significantly differ. 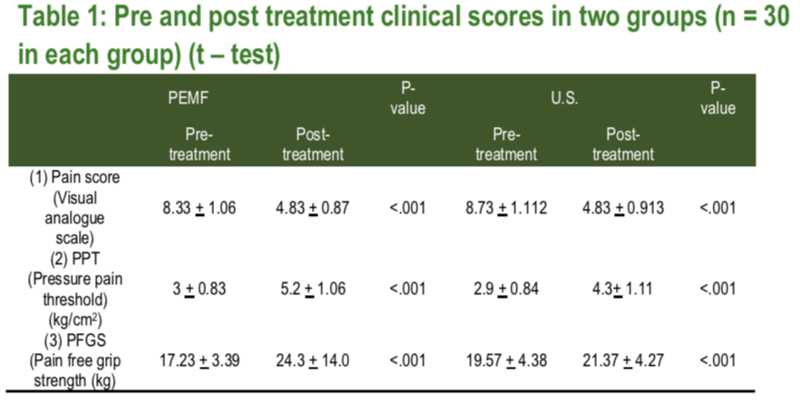 PEMF give significantly higher gain in PPT and very marked gain in PFGS as compared to U.S. therapy. Conclusion: PEMF therapy was found to yield significantly superior relief than ultrasound therapy in patient of lateral epicondylitis with respect to pain, pressure pain threshold (PPT) and pain free grip strength (PFGS). Improvement in pain score was similar in two groups. 1. Thurston AJ, Conservative and Surgical treatment of tennis elbow: a study of outcome. Aust NZJ Surg 1999; 68(8): 568-72. 2. Assendfelt WJ, Hay EM, Adshead R, Bouter LM. Corticosteroid injections for lateral epicondylitis: a systematic overview; Br J Gen Prat 1996; 46: 209-16. 3. Chiang HC, Koyc, Chen SS, etal. Prevalence of Shoulder and upper limb disorders among workers in the fish processing industry. Scand J Work Environ Health 1993; 19: 126-31. 4. Kurppa K, Kiikari Juntura E, Kuosma E, Kuushonen M, Kivi P. Incidence of tenosynovitis or peritendonitis and epicondylitis in a meat processing factory. Scand J Work Environ Health 1991; 17: 32-7. 5. Ranney D, Wells R, Morre A. Upper limb musculoskeletal disorders in highly repetitive industries: precise anatomical physical findings. Ergonomics 1995; 38: 1408-23. 6. Greenfield C, Webster V. Chronic lateral epicondylitis; Survey of Current practice in outpatient departments in Scotland. Physiotherapy 2002; 88(10): 578-94. 7. B. Vicenzino, Lateral epicondylalgia: a musculoskeletal physiotherapy perspective master class. Man Ther. 2003; 8(2): 66-79. 8. Coomber BK, Bisset L, Vicenzino B. A new integrative model of lateral epicondylalgia. Br J Sports Med. 2009; 43: 252-258. 9. L Bisset, a Paungmali, B Vicenzino et al. A systematic review and met analysis of clinical trials on physical interventions for lateral epicondylalgia. Br J sports Med. 2005; 39: 411-422. 10. Guo L, Kubat NS, Isenberg RA. Pulsed radio frequency energy (PRFE) use in human medical applications. Electromagn Biol Med 2011; 30: 21- 45. 11. Guo L, Kubat NJ Isenberg RA. Meta-analysis of clinical efficacy of pulsed radio frequency energy treatment. Ann Surg. 2012; 255: 457-67.
augmentation patients. Aesthetic plast Sung 2008; 32: 660-6.
numerical pain rating scale. Pain 2001; 94: 149-58.
review. Journal of hand therapy. 2004 Apr. 1; 17(2) : 152-67.
orthop sports phys Ther 2003; 33: 400-7. Physiother Res 2015; 3: 839-44.
disability scale.Phys Ther 2001; 81:776-88. 21. Dworkin RH,Turk DC,wyrwick KW,Beaton D,Clecland CS,Farrar JT,etal. clinical trials: IMMPACT recommendations.J pain 2008; 9: 105-21.